BBQ in the Big Apple? 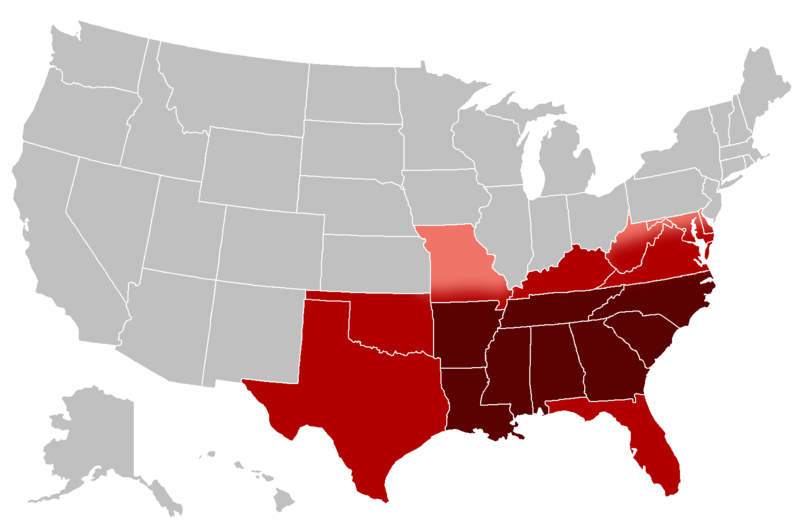 As the map here shows, BBQ is typically a southern USA tradition. From Virginia to Florida over to Texas into Tennessee and everywhere in between, barbecue is a way of life and there is even heated discussion over where exactly in the South is the birthplace of smoking meat over low heat. 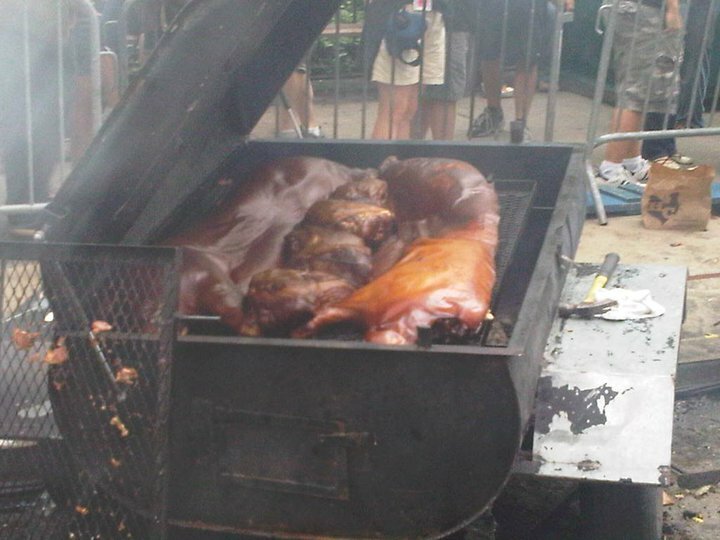 So who would have ever thought that New York City would become a host to a large southern BBQ celebration. The city of hustle and bustle, Madison Ave, exorbitant real estate prices and thousands of AAA restaurants where amuse bouches are the “de rigeur” is transformed, if only for a moment, into a down home cookout called the Big Apple Barbecue Block Party…and it is truly awesome. 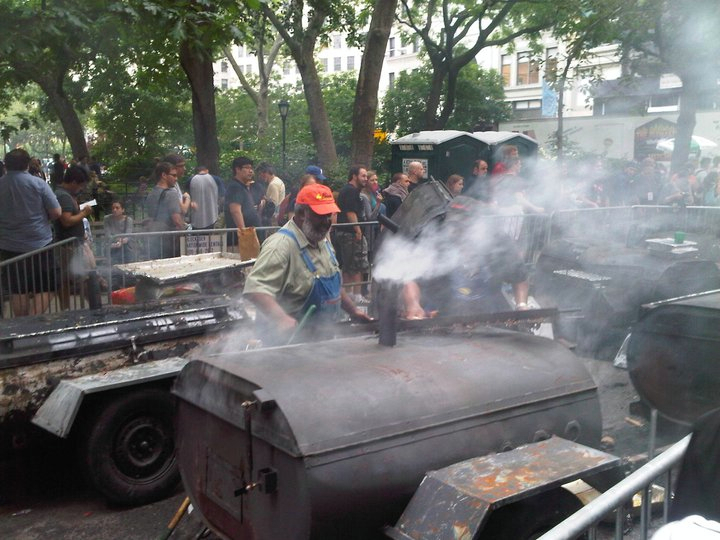 Each year for two days in the month of June, Madison Square Park is the scene for authentic BBQ made by traditional pit masters who travel far and wide to put on a show and live performances from musical artists specializing in rock and blues. The best part…its all FREE admittance! Yes, just pony up, smell the “Q” and enjoy the music. When your hunger level starts going off the charts, just saddle up to one of your favorite pit masters and you can purchase a plate of fresh and ready BBQ. Life does not get any better than that! I was fortunate enough back in 2011 to be able to attend this amazing event. My spouse, Charlene, was living in NYC that summer as she was doing an internship at the United Nations. The weekend I visited her just happened to be the one when this party was taking place and we definitely didn’t want to miss out. Here are a couple pics of the legendary Ed Mitchell who introduced me to whole hog bbq and how amazing food can come out of something that looked like a homemade oil drum. Needless to say my world was turned upside down as I had never been this close to the inner workings of a true southern pit. I know there are a million things to see and do in NYC but if you happen to wind up in town around June, this is one amazing event that you do not want to miss…I know its on my to-do list again!